Have you ever had a slice of fruitcake that you liked? Me either. I think it is a great concept but I have never had one well executed with a taste I would crave again. Fruitcake is just one of those things that people used to have around and now some people put a loaf of it out around the holidays as a tradition. Why are we talking about fruitcake when I posted a picture of cookies? You know those cherries that come out around Christmas that are soaked in a mixture of dye and high fructose corn syrup? Those are essential to these cookies. They are the cherries that bring a hint of sweetness to these shortbread cookies. Every year I make them for Christmas and every year I have some cherries left over. Perfect. All you have to do is make them for Valentine’s day and it is the perfect use for those leftover cherries. 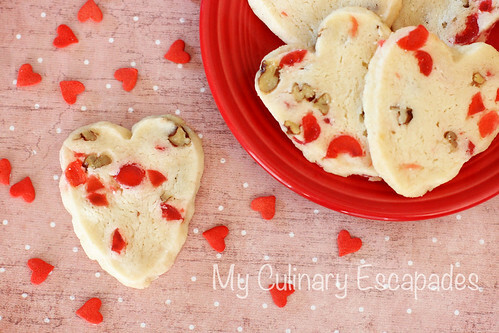 Before storing them in the fridge to harden just shape the loaf into a heart shape and you have heart shaped cookies perfect for Valentine’s Day. Beat butter for 30 seconds. Add sugar and beat until fluffy. Add milk and vanilla, beat well. Stir in flour, then cherries and pecans. Place a sheet of wax paper on your counter. Shape dough into 7 inch long roll. Shape bottom of heart sides first by pressing them alternately on the counter creating the “v” portion of the heart. Then using a dough scraper press gently in at the top until your cylinder resembles a heart. I found that the hearts did not keep their shape as well if they were rolled in coconut but if you want to put it on the outside now would be the time. Roll dough in coconut to coat outside. Wrap in waxed paper. Chill thoroughly (overnight is best). Cut into 1/4 inch slices. Place on ungreased cookie sheet and place in freezer for 10 minutes just before freezing. This will ensure that your hearts stay heart shaped and don’t spread. Bake 12-15 minutes (or until golden brown on edges) at 325 degree oven.